“Black Friday” – What’s in a name? Throughout the year, retailers run on slim margins, often “in the red“. 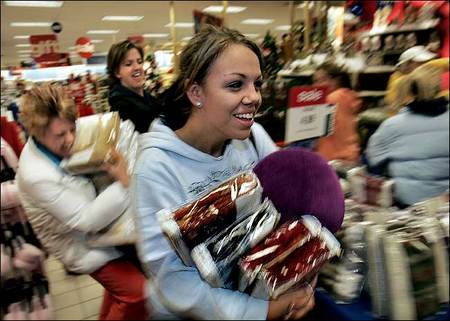 “Black Friday” is an accounting expression, not psycho-babel. It’s the day of the year when retailers, particularly the retail giants, move out of red ink into the black. At this point in time, our actual unemployment rate is approximately 12.6%. One would assume workers would be eager to do whatever it takes to keep a job, wouldn’t you? Then, what’s to be said about a petition by a Target Stores employee to “save Thanksgiving“? A building socialist storm threatens their existence. The Communist Party USA promises “a world where people and nature come before profits. That’s socialism. That’s our vision. We are the Communist Party USA.” Blindly ignorant socialists imagine a world free of capitalism. How does socialism differ from capitalism? The differences are distinct and striking. A dictionary definition of socialism is “a political and economic THEORY of social organization which advocates that the means of production, distribution, and exchange should be owned or regulated by the community as a whole“. Why call socialism a theory? Simple: it’s NEVER been proven to work. In contrast, the dictionary definition of capitalism is: “an economic and political SYSTEM in which a country’s trade and industry are controlled by private owners for profit, rather than by the state“. Note key difference between socialism and capitalism – THEORY vs. SYSTEM. Socialism will forever remain an economic and social theory. Nonetheless, socialism lives in America, a nation that has fought wars to preserve freedom, freedom socialists urgently wish to take away from you. I offer the following links for your edification. There used to be things called “Blue Laws” that prevented business from being open on Sundays so that it would not offend the Lord on his designated “day of rest” and that people could concentrate on their worship, faith and family on the one day of the week. Faith apparently came before profits. Funny. I never heard anyone call that scenario socialism. While you may see Thursday as a sabbath, I think you miss the point. The Cloward-Piven strategy, named for two Columbia University professors who wished to destroy American capitalism and institute socialism. The purpose of the Cloward-Piven strategy is to force “political change through orchestrated crisis. How does one “bankrupt the welfare system”? One does this by overaloading unemployment rolls, extending unemployment benefits, taking power from business owners and transferring it to employees. Target employees are free to NOT work, if they so choose. It’s not that there is a gun to their heads, so to speak. Regarding the sabbath topic you brought up, let’s consider the words of Jesus Christ and what he had to say about working on the sabbath. Whether someone works on Thanksgiving day or no, is of no consequence to Jesus Christ. Back to the subject of socialism, fulfillment of the Cloward-Piven strategy whereby employees who have little to lose dictate the terms of their employment, businesses are doomed to failure. I encourage you to follow the links and learn all you can about the threat socialism poses to our freedoms. I genuinely appreciate your comments. I still see no difference. The workers do not want to work on Thanksgiving Day (a national holiday) a holiday set aside each year for giving thanks to God for blessings received during the year and is celebrated through feasting and prayer. I’m just saying I fail to see a difference between that and working on a Sunday. There was a time when people refused to work on Sundays citing their religion AND also enforced laws to make it so. Doing that was not called “socialist” but somehow today workers wanting to refuse working on Thanksgiving is? I was just thinking too, that while yes these workers are “free” to not work the holiday, they will surely be fired if they don’t (as anyone who has worked retail lately knows, you are expected to be available 24/7 hours). These are low-paying jobs, and I’m sure these ‘folks really NEED them to support their family, so in essence, they are not really so free to leave. I feel for them. I do not shop on Thanksgiving Day or Black Friday. If this makes me a “socialist” then, whatever. I think I will keep my money instead of giving it to capitalist retailers who peddle Chinese-made junk we don’t need. Not a retailer, but a capitalist nonetheless, I sense the need to speak from the point of view of a business owner of 25 years. I don’t set my working hours, My customers set my working hours. True, we generally provide our goods and services during “normal” working hours, but sometimes my customers need my services at 2 in the morning and sometimes on Sundays. My point is simply this: retailers do not decide when customers want to shop. They simply respond to market forces. No, I’m not a part of some evil conspiricay to deprive employees of essential sleep. No one dreads the midnight emergency calls more than me, so I can assure you there is no movement on my part to disrupt circadian rhythms. We are a nation of over 310,000,000 souls with over 310,000,000 individual needs. A successful business is one that goes the “extra mile” to serve the needs of its customers. In fact, for over 15 years I have not practiced active selling. All our business comes by way of referrals, because the giants of my industry – evil, greedy corporations – don’t answer the phone after five and don’t care about customer satisfaction. The take-away I wish to suggest to you is simply this: there is an active and growing socialist movement in this country to demonize all businesses, particularly large targets like Target, Wal-Mart, Macy’s, etc. Please re-read the article. Follow the link to learn about Cloward-Piven strategy to destroy our economy through created crises. If your sole focus remains on whether our not someone loses sleep, you will miss understanding a clear and present threat to American freedom.